Chris Forrester picked up a knock against Millwall. Posh manager Graham Westley has warned his players to take no notice of Swindon Town’s injury and suspension woes. 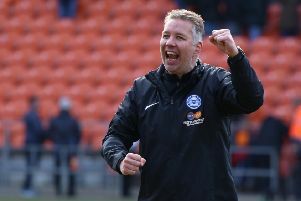 A vibrant Posh side look to have a great chance of victory at the County Ground on Saturday against last season’s League One play-off final losers. Swindon, who are managed by one-time Posh bossMark Cooper, have nine senior players injured including star striker Wes Thomas and have now lost key defender Jordan Turnbull after he was sent off in Tuesday’s Johnstone’s Paint Trophy defeat at League Two local rivals Oxford United. Swindon are short of defenders for the visit of Posh so a move into the loan market can’t be ruled out. The Robins have also lost Irish midfielder Jordan Stewart who is up for sale after just a month at the club because of homesickness. Swindon haven’t won at home since the first day of the League One season when they beat Bradford City 4-1. But Westley said: “Swindon have plenty of good players and they will still be capable of putting a good team together. “They will pass the ball well and they will have threats, but we won’t be concerning ourselves with their problems. Posh have several unavailabilities themselves. Central defender Jack Baldwin, left-back Kgosi Ntlhe, striker Joe Gormley and midfielder Harry Beautyman are long-term absentees who remain on the sidelines. Playmaker Erhun Oztumer is suspended, but fellow midfielder Jermaine Anderson is available after completing a three-match ban. Anderson may go straight back into the starting line-up as manager Westley admitted he was slightly forced into his bold, attacking team selection ahead of the 5-3 win over Millwall last Saturday by the absence of two key midfield players. Several first-choice players sat out training in the early part of this week to rest knocks. Midfielders Michael Bostwick and Chris Forrester, goalkeeper Ben Alnwick and star attacker Marcus Maddison were those to sit out. Westley added: “There are always bumps and bruises on a Monday morning and we had a few players carrying knocks after three matches in quick succession. “All the players are monitored, but it’s too early in the week to know for sure who will be available and who won’t. Maddison’s sore ankle is causing Posh the most concern. Losing Maddison would be a blow. He’s the club’s top scorer with five goals, but he’s also provided multiple assists, including three against Millwall.